Picking the winners: (From left): V.S. 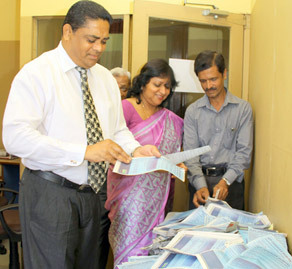 Bois (DGM Finance ANCL), Kumudu Gunawardene (Company Secretary ANCL) and Jagath Hewapanne (Editor Kreeda) picking the winners coupons at the end of count 12 at the Sunday Observer-Mobitel Most Popular Schoolboy Cricketer of the year contest 2014.Pic: Chinthaka Kumarasinghe. 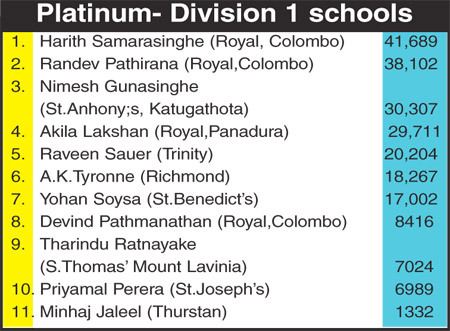 The hectic tussle between the two Royalists Harith Samarasinghe (41,689) and Randev Pathirana (38,102) continued as Samarasinghe took over the lead from Pathirana to occupy the top spot with a lead of 3587 votes in the ‘platinum’ competition at the end of count number 12 in the Sunday Observer/Mobitel Most Popular Schoolboy Cricketer Of the year contest 2014. 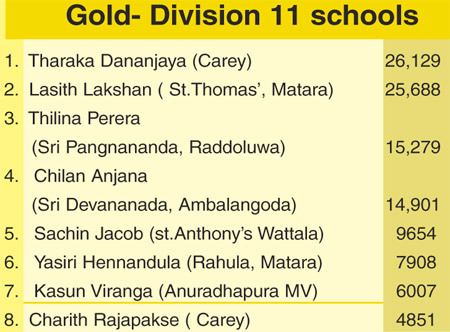 In the ‘gold’ category for division 11 schools there is also a stiff competition between St.Thomas’ Matara’s Lasith Lakshan( 25,688) and Tharaka Dananjaya(26,129) of Carey who took the lead this week with a majority of 441 votes.There have been two significant changes in the ‘silver’ segment for division 111 schools as Zaafi Zarook of Viodyaloka ,Galle took over the lead from last week’s winner Dilshan Kanchana of Devapathiraja ,Ratgama with a lead of 536 votes. 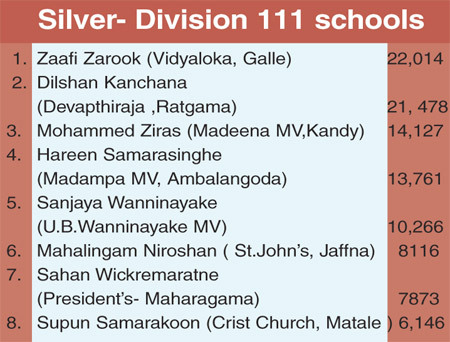 Mohammed Ziras of Madeena MV, Kandy went one step up to take the third spot ousting Hareen Samarasinghe of Madampa MV, Ambalangoda .